OK, so the “save the date” doesn’t actually say “Galaxy Note 2” on it, but with that big S Pen showing, we’d be ultra-confused if it were for anything else. 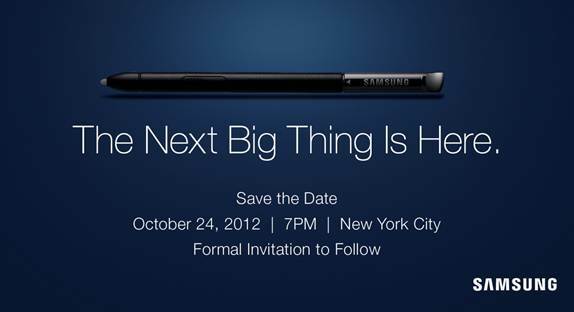 So there you have it, Samsung is throwing some sort of party in NYC on October 24 to unveil the “Next Big Thing,” again. Samsung already announced that the device would arrive in the U.S. by mid-November, so we’re assuming this is simply a kick-off party for the phone. Since they originally announced the Note 2 at IFA in Berlin, it makes sense that Samsung would do something Stateside as well. Hopefully, we’ll hear launch dates.